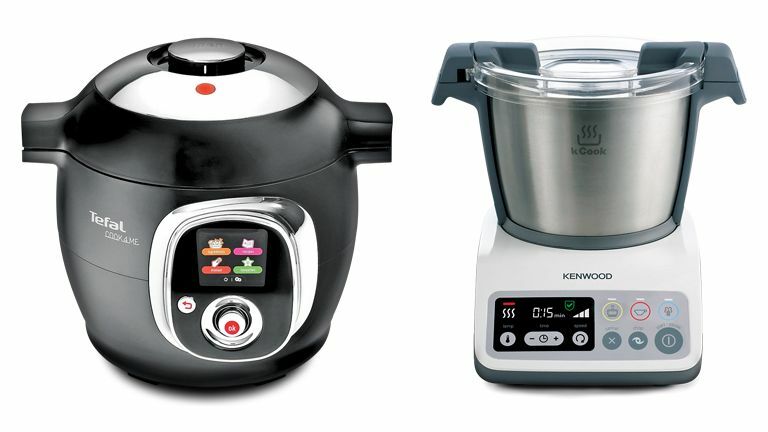 Two smart multi-cookers go toe-to-toe, however, which will withstand the pressure and which will become all stewed? The Snorlax of the multi cooker world, the Cook4Me is cute, but deceptively huge. If your kitchen isn't gigantic, this is going to dominate your worktop. It needs the space because it's a pressure cooker, not just a regular one. Embracing its techy side, the Cook4Me has a colour screen on its front and a little knob to let you select from the 50 inbuilt recipes. There's Bluetooth to connect to a phone, but the app is pretty buggy. It isn't quite as smart as it looks. You get different cooking modes, including standard pan-style cooking, steaming and pressure cooking, which will zap a stew in 20 minutes rather than two hours. It doesn't chop or stir for you, though. It's a cooker. Full stop. With a slight excess of interface, you do have to perform a bit of knob-swizzling to get started. However, with one central bowl to clean there's not much maintenance involved. But be warned: the bowl may bogart your entire drying rack. Looking like a piece of science equipment, the kCook isn't super-chic. But it is far smaller than the Cook4Me while still being able to cook up 1.5-litres in one go. The myriad of buttons on the front panel demos its hands-on approach. This is a real one-stop cooking monster. It chops, it stirs and it cooks. Sauté? Steam? No problem. It's low on show-off smarts, but does have some recipe presets and an app that breaks down recipes into step-by-step kCook instructions. You don't get ultra-fast pressure cooking here, but auto-stirring makes getting out of the kitchen to spend quality time with the TV much easier. Its one annoyance is the whirring noise it makes while stirring. It ain't silent. Keep it simple, stupid. Sure, there are cooking presets and a companion app, but there's also a big 'chop' button on the front. You don't get much more intuitive than that. It's a smart cooker that doesn't tangle you up with show-off features. T3 Rates:Auto-Stirring is extremely handy. The kCook is also fairly petite – so won't crowd your worktop. T3 Slates:In no way a style icon. There's no pressure cooking, which is a little annoying. T3 Rates: Stylish lines. Pressure cooking is quiet and effective. On-screen recipes are a nice touch. T3 Slates: Big enough to be impractical for some. Doesn't chop or stir. Smartphone integration needs work.